My size small base camp duffel is a favorite for short work trips and toting small amounts of extra gear to and from a trailhead. It is built to withstand harsh punishment, easy to carry, and easy to access the interior contents. Cost is the only negative. 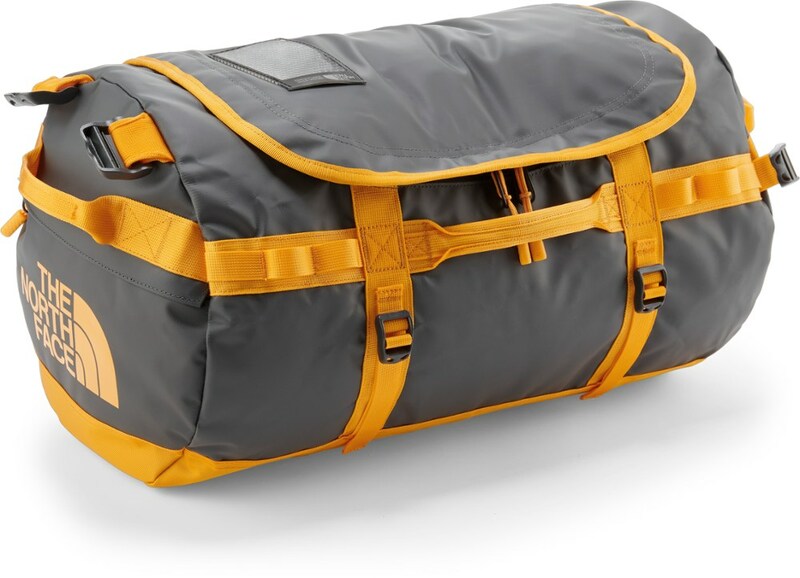 Available from carry-on size to trek-swallowing massive, the base camp duffel might be the most indestructible and comfortable way to get your stuff from one place to the other. 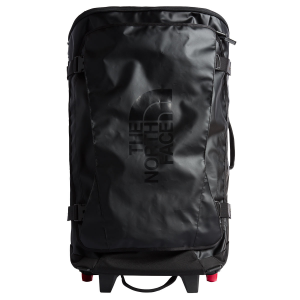 Mine is a size small, and I use it primarily for air travel, national and international, and for storing extra stuff to toss into the back of the car for a hiking trip. Mine is about five years old. What makes this such a great bag? The bag itself is pretty simple—one D shaped zipper opening, super durable handles, straps and materials, very usable shoulder straps for getting this through airports or carrying to a remote bus stop. Except for the bottom, which is double layered, the rest of it is made from heavy-grade material that is waterproof and very heavy duty. The straps are similar to seat belt material and all stitched very securely. I haven't had anything pull off or even had stitches come loose. Top and bottom attachment points for the shoulder straps are equally durable. The photos below are side and bottom views. Note the daisy chain stitched to the side, makes it easy to secure this to a roof rack if needed. Also, you can see the double layered bottom. The sides also have functioning compression straps. Double-layered ballistic bottom to protect it from the ground. 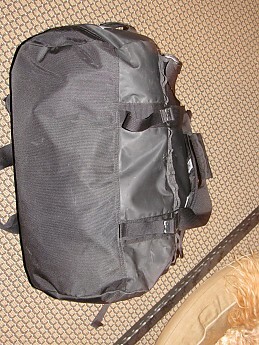 Other than the bag being a bit dirty and scuffed, I haven't made a dent in it. 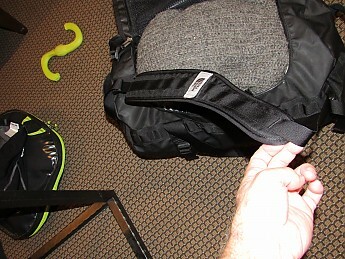 One burly zipper opens it up, and you can see the full contents of the bag easily. A very helpful advantage over a straight zipper, makes it easier to load, unload, find things. 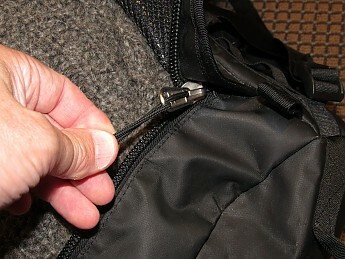 Good, easy to grab loop on the zipper. Note the only interior pocket on mine, inside the top. It's nylon mesh and zips shut, my normal place for toiletries and chargers. You can see how the flap on the top overhangs the zipper to keep moisture out. 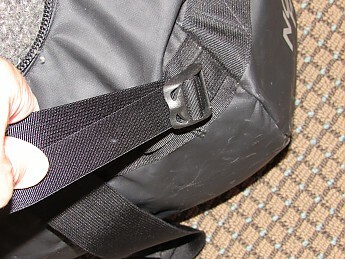 This photo shows the primary hand straps—you can keep them secured to each other by a piece of nylon that hooks/loops the handles. Comfortable to carry this way, even if it's heavy. Each end also has a handle, so you can grab that and go. Note the stitching that secures the handle to the bag. That's typical throughout. 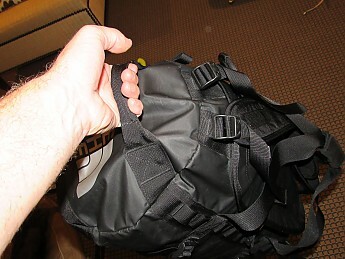 Finally, the pack has very good shoulder straps for a duffel bag. I don't have any photos of myself carrying it around, but that is the primary way I trek it through airports. You can adjust the shoulder straps both top and bottom to get them to fit right. They are relatively thinly padded, but they are positioned well to carry the weight—it's the primary way I carry this bag through airports, unless I'm wearing a suit jacket and don't want to rumple it. The bag stores roughly 50 liters of stuff. I bought this on sale; it costs about $120 today at full retail. That is an awful lot of money for a smaller duffel bag, but it's nothing compared to high end travel-purposed bags like you get from Tumi. 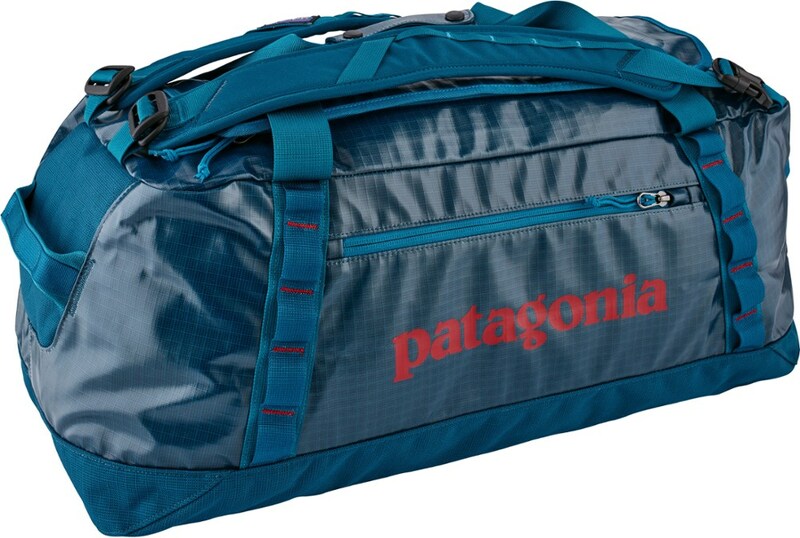 Also, you can bank on this bag lasting a decade or more, so that's a cheap carry-on bag or two you won't have to buy and wouldn't use to haul gear to a trailhead anyway. Also, it's a little tough to put a price on knowing your bag is comfortable and bombproof. I considered it a luxury buy when I got it, but I'm very happy I did. I've got this exact same bag (also in black) and the exact same dog toy. Both are equally durable! Hahaha. Great review man. It's huge!! Excelent for an expedition or for travel anywhere without concern of dust, or an angry cargo man dropping it. Use it for packaging to EL CHALTEN. 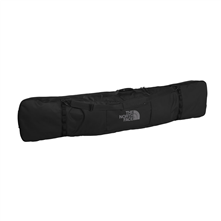 This is a super durable bag that can stand up to some pretty rigorous outdoor activity. 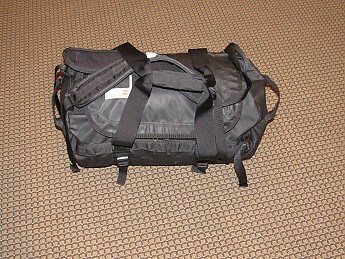 The Base Camp Duffel also looks casual enough to use just as a weekender bag for clothes and essentials for the road. Moosejaw hooked me up with a small Base Camp Duffel and it's actually even more awesome than I expected it to be. The straps that let you wear it backpack style are my favorite thing about the bag. why don't all duffels have a hands-free feature? The bag is super tough and even made it through my puppy's teething stage, unlike most other things I own. This has got to be the most durable bag I've ever owned. On top of function, the color is totally awesome. I honestly don't have a bad thing to say about this bag. 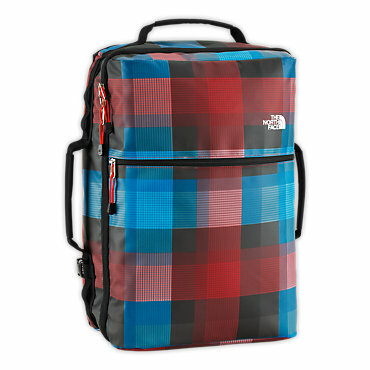 This bag is great on the trails or even just as a clothes holder for a quick weekend getaway. I wouldn't mind having some more pockets, though. Maybe some smaller easy to access zipper pouches on the outside. 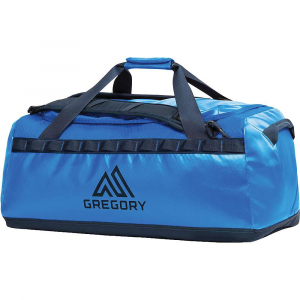 The bag has one main compartment and a mesh zipper pocket inside the top flap of the duffel. If you enjoy compartmentalizing your various travel items, this may not be the bag for you. If you don't mind everything being in the same place, this is a great bag. Especially if you're rough on luggage. Overall, this is a high quality bag that adjusts to your carrying needs. Used for backpacking trough Colombia, Iceland, and China. Backpack straps make it easy to carry heavier loads, but not comfortable for carrying longer than 20 mins. No issues carrying the large size on plane (though never had it stuffed full). Durable, does well in rain, and looks great. 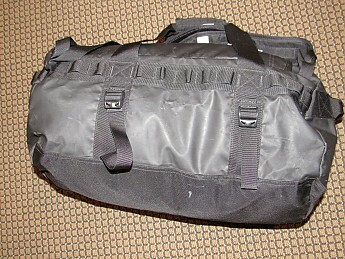 Bought and used to replace a typical backpacker backpack for extended travel as it has larger capacity and can still pass for a carry-on on a plane. Used the large size for 20-day trip through Colombia. 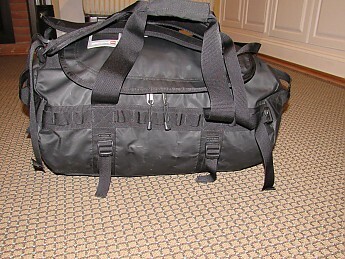 Held up well to bus, boat, and plane travel (both checked and carried on). Contents remained dry in 15 min downpour. 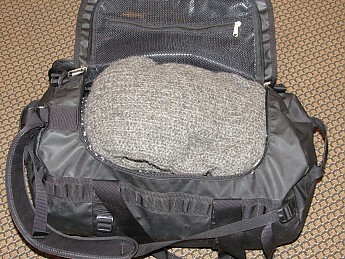 Mostly used backpack style for carrying to and from hostel/airport/bus terminal. I always tightened the side straps before heading to the airport so the bag was as slim as possible and could therefore be carried on. 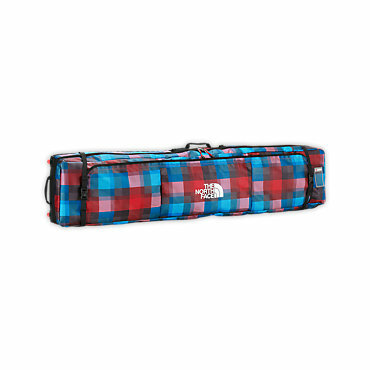 While it may just be a "duffel," the TNF Base Camp Duffel is nearly indestructible, easy to load (one large compartment with one inner mesh pocket), and it is easy to carry: it has two handles and two backpack-like shoulder straps in addition to compression straps to cinch down the load. The zipper sometimes gets stuck when the load is full and the price tag is a bit steep but, all things considered, you get what you pay for and it's a fantastic purchase. I have both a large one and a medium one, and the above can be said for both.